How do you prepare for a fight with a man who broke the world record for the hardest punch ever thrown just last month? Thankfully, The Plug doesn’t have to find out first hand from Francis Ngannou. That’s for his opponent—UFC champion Stipe Miocic. The two square off in the highly anticipated UFC 220 this weekend in Boston. Ngannou is one of the fastest rising names in mixed martial arts and a win over Miocic would make him the first Cameroonian and African to lift the UFC title. But he’s far more than just a guy with one helluva punch. Ngannou opens up to The Plug about his journey to present day fame and President Donald Trump’s recent comments about “sh*thole countries.” From leaving his native Cameroon to pursue a life he knew was possible—a huge risk given the way of life and lines of thought there—to being homeless in Paris and how fighting became not only his life story, but now his life’s work, no stone is left unturned. From there, the Squad discuss last weekend’s “Minnesota Miracle,” the future of Saints rookie Marcus Williams who missed the tackle, the NBA on MLK Day, and more. Tell everyone you know to subscribe to The Plug on the ESPN app! 4:41 PMAfter the Los Angeles Clippers’ 113-102 home win over the Houston Rockets on Monday, a game in which many a technical foul was called or missed, Rockets guard Chris Paul led a Suicide Squad bunch of teammates to their opponent’s locker room to, in theory, engage in fisticuffs. As is always the case, barring Kobe Bryant-Chris Childs and Serge Ibaka-James Johnson, the players had no intention of actually fighting (a witness told ESPN’s Adrian Wojnarowski that the fight was “classic NBA” and that “none of these guys were going to fight”). In any event, the Ocean’s Eleven-style mission got us to thinking of other times professional athletes have attempted to run up on their opponent while in the sanctity of the room in which they shower. Here are 10 instances when professional locker rooms were under the threat of being breached. During the 1922 World Series between Babe Ruth’s New York Yankees and Johnny Rawlings’ New York Giants, the “Sultan of Swat” grew tired of Rawlings’ bench jockeying, so he and teammate Bob Meusel “invaded” the Giants’ locker room hoping to scrap. No hands were thrown, but the Giants technically won the non-fight, as they won the series 4-0-1 and held Ruth to just two hits and zero home runs. Zach Randolph and Kendrick Perkins were ejected in the fourth quarter of the Memphis Grizzlies’ 107-97 win over the Oklahoma City Thunder for arguing with each other (Randolph apparently yelled, “I’ll beat your a–” at Perkins), but the drama didn’t end there. The two reportedly tried to continue the altercation in the back hallways, with Randolph crossing over to the Thunder’s side of the building, earning him a $25,000 fine from the NBA. All’s well that ends well, as the two immediately squashed the beef. Lance Stephenson, then in his first stint with the Indiana Pacers, had become a thorn in the side of the Miami Heat long before he blew into the ear of LeBron James during the 2014 playoffs. Stephenson and Heat center Juwan Howard, much like the respective teams they played for, had been feuding all season, and after an on-court confrontation during the second round of the 2012 playoffs, Howard, full of old-man strength, walked over to the Pacers’ locker room to try to find Stephenson. He failed in his search, but the Heat won the series in six games and eliminated the Pacers from the playoffs the next two seasons as well. Longtime Heat (and Golden State Warriors and Toronto Raptors and Kentucky and Texas A&M) fan Drake, after the Heat’s Finals victory over the San Antonio Spurs in 2013, attempted to sneak into Miami’s locker room with credentialed media to celebrate with LeBron & Co. While not an act of an athlete attempting to barge into a locker room, the most famous musician in the world’s failure to even make it through the doors merits a spot on this list. It was reported at the time of this incident that Kevin Garnett, who has lost all benefit of the doubt for the things he’s said over the years, said Carmelo Anthony’s wife, La La, tasted like “Honey Nut Cheerios” (La La Anthony has since denied it.) Well, Anthony did not take too kindly to another man saying his spouse tasted like a nutritional breakfast, so he headed straight to the Boston Celtics’ locker room area (and team bus) to have a “one-on-one conversation” with Garnett. Anthony was suspended by the NBA for one game. Vancouver Canucks coach John Tortorella, best known outside of the world of hockey for threatening to bench Team USA players if they sat for the national anthem, attempted to enter the Calgary Flames’ locker room to confront his counterpart, Bob Hartley, in response to the two teams brawling at the start of the game. In essence, Tortorella wanted to fight the other team because his players fought the other team. Hartley was fined $25,000 by the NHL. A year before his first of back-to-back NBA MVP awards, Stephen Curry was in the midst of just his third career playoff series when he and fellow guard Steve Blake rolled up on some Los Angeles Clippers ball boys for a comment that a Clippers assistant coach made after Los Angeles eliminated the Warriors in the first round of the playoffs. That led to players from both teams convening in the hallway between the two locker rooms, and, according to former Clippers guard Jared Dudley, Curry barging into the Clippers’ training room. The Los Angeles Police Department and Staples Center security were dispatched, but the incident calmed down from there. It appears this wasn’t the Rockets’ first — pardon the pun — rodeo. Just 13 months before Monday’s kerfuffle, a contingent of Houston players, led by habitual line-steppers Trevor Ariza and James Harden, waited outside the Dallas Mavericks’ locker room for center Salah Mejri, who allegedly insulted Ariza’s family (Mejri denied this.) Ariza, supposedly the “first one through the door” during the Clippers incident, was accompanied to the Mavs’ locker room by two security guards like he was Bill Goldberg, but the altercation ended in neither blows nor fines/suspensions. As appears to be the trend in these almost scuffles, New Orleans Pelicans power forward DeMarcus Cousins went after Kevin Durant after both players were ejected from the Golden State Warriors’ 125-115 win at the Smoothie King Center. An amazing photo by a New York Times photographer captures the exact moment Cousins was ready to scrap. Per Times reporter Scott Cacciola: “Cousins was storming down the hallway in search of Durant, who was making his way off the court after his ejection and toward the locker room. Security officers, aware that trouble was brewing, quickly diverted Durant to a small corridor as several others slowed Cousins’ progress.” Surprisingly, Cousins wasn’t fined or suspended for this incident. Apparently after Demarcus Cousins and Kevin Durant were ejected after barking at each other during the GSW/NOP game Boogie stormed down the hallway near the locker rooms in search of KD and had to be restrained. Will Kanye’s new daughter influence his future art? West and Kardashian West are two of the most famous people in the world, as a couple and individually. But the image of them as parents appears to be very private — as much as one can be in a Kardashian world. And, whether by design or destiny, West’s been unusually silent for nearly a year. Of course, with West, cameras are always around, but the “Famous” producer, designer and rapper hasn’t made many headlines since his brief moment with then-new President Donald Trump and an onstage rant that became fodder for Jay-Z’s Grammy-nominated 4:44. Maybe West needed to fall back for a minute? He is listed as an executive producer on Damon Dash’s new film Honor Up (set for select theaters and OnDemand Feb. 16). But musically, even if West has been privately active, he’s been publicly dormant, a strategic move that may play in his favor if, in fact, he’s been in a creative musical cave. And it’ll be interesting to see whether the birth of his third child influences his music in the ways North and Saint did. But: Until concrete evidence is provided, talk of a new Kanye project will remain just that — talk. Then again, he’s got more important duties to take care of at the moment. New babies are everything. 3:40 PMThirty-five years after his No. 22 jersey was retired, Los Angeles Lakers great Elgin Baylor is being honored with his very own statue for his contributions to the team. The Hall of Famer’s statue will join the likes of former Lakers players Shaquille O’Neal, Jerry West, Kareem Abdul-Jabbar and Magic Johnson and Lakers broadcaster Francis “Chick” Hearn in Star Plaza at the Staples Center in Los Angeles. An outdoor unveiling ceremony will be held April 6 shortly before the Lakers’ tipoff against the Minnesota Timberwolves. Baylor entered the NBA after being drafted No. 1 overall by the Minneapolis Lakers in 1958, and he averaged 27.4 points, 13.5 rebounds and 4.3 assists in 846 games during the course of his 14-year career. He earned his spot as a first-team All-NBA player 10 times and appeared in 11 All-Star games. Baylor was inducted into the Naismith Memorial Basketball Hall of Fame in 1977, six years after announcing his retirement, and was the Los Angeles Clippers’ general manager for 22 years. After being present for the unveiling ceremonies of O’Neal, West, Abdul-Jabbar and Hearn, Baylor being honored with his own statue is only right. 10:58 AMWhen NBA players live and work in a city where Martin Luther King Jr. made such an impact, they find themselves faced with a duty to defend their home court. The Memphis Grizzlies maneuvered their way to a 123-114 win over the Los Angeles Lakers on Monday at the FedEx Forum in the 16th Annual Dr. Martin Luther King, Jr. Day Celebration. The day consisted of many festivities including the honoring of WNBA and NBA players during the 13th Annual National Civil Rights Museum Sports Legacy Award. This year’s recipients were Penny Hardaway, Sam Perkins, James Worthy and WNBA All-Star Swin Cash. The award recognizes dedicated contributions to civil and human rights and laying foundations for future leaders through their career in sports in the spirit of King. 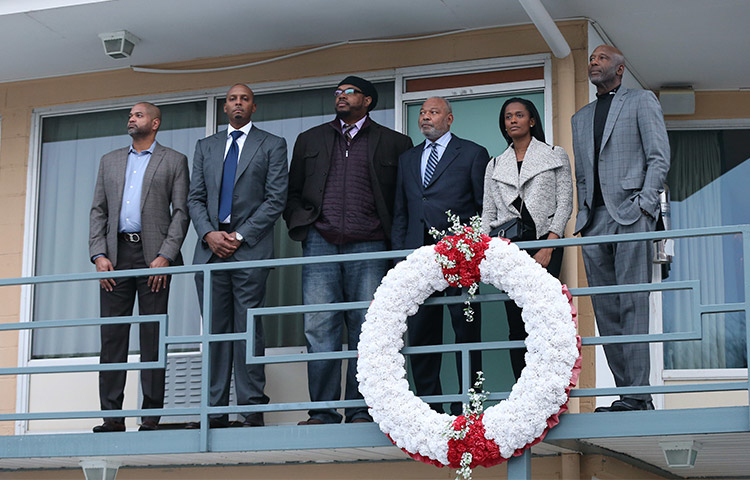 (From left to right) Grizzlies interim coach J.B. Bickerstaff, Penny Hardaway, Sam Perkins, Bernie Bickerstaff, Swin Cash and James Worthy tour the National Civil Rights Museum in Memphis, Tennessee. The weekend was filled with events that included a discussion at the National Civil Rights Museum (“MLK50: Where Do We Go From Here”) with Cash, Grizzlies guard Mike Conley and Lakers center Brook Lopez. Before tipoff on Monday, the honorees participated in the Earl Lloyd Sports Legacy Symposium. Sports teams often visit the National Civil Rights Museum in Memphis, which houses the location where King was shot. Check out what players had to say about playing in Memphis on MLK Day while the city prepares for MLK50, the 50th year commemorating King’s death.